Note: I also wrote a programming book. If you are a full stack software developer by chance, please do check it out. A Promise is a proxy for a value not necessarily known when the promise is created. It allows you to associate handlers to an asynchronous action's eventual success value or failure reason. This lets asynchronous methods return values like synchronous methods: instead of the final value, the asynchronous method returns a promise for the value at some point in the future. In simple words “A promise is a word taken for some action, the other party who gave the promise might fulfill it or deny it”. In the case of fulfilling, the promise gets resolved, and in another case, it gets rejected. The code which uses a promise should call then function on that promise. It takes two anonymous functions as parameters. 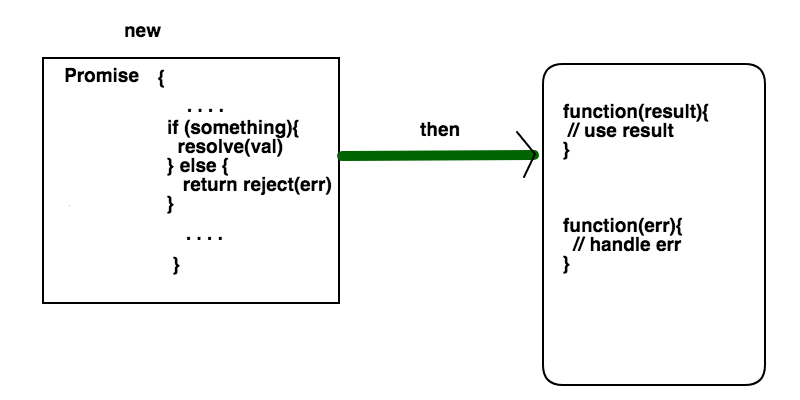 The first function executes if the promise is resolved and the second function executes if promise is rejected. What happens if you try to access the value from promise before it is resolved or rejected. Then promise will be in the pending state. All Node JS developers agree upon one point. Node development is quite different from other programming languages like Python or Ruby. In Python, you write code in a straight way with expected behavior. But in Node because of asynchronous factors, the code might freak you out with unexpected behavior. Variables you define and assign will not have values at the point where you need it. The scope is a bit tricky. If there is a lot of I/O in your applications God knows what can happen. Basically, Node is not sequential. A different mindset is needed while developing applications on Node platform. One of my friends Surya newly started writing few applications using AWS Node SDK. He irritated a lot and almost gave up because of the uncertainty of code by comparing that to his previous ANSI C coding experience. In this article, I will show how we can use Promises in Node JS to bring certainty to our code when there is a lot of I/O(HTTP requests) performed. We can create a promise in our Node JS program using the new constructor. For all the examples I use Node v6.5.0. You should install Node JS on your machine before beginning with this tutorial. Even though promises can be used in browsers, this article mainly focuses on writing asynchronous code on Node. So myPromise is a Promise type object which allows us to use it for later. If you make an HTTP GET request for this URL, you will be returned a JSON with all stats about myself like repos, followers, following, stars etc. For making an HTTP request from our Node app, let us install a small package which make things clear. request package removes the boilerplate code of inbuilt http package. I am going to use this as an example for our node application. Suppose we have a global variable called userDetails in our code and we thought to initialize it. It needs to fetch details of a Github user from Github and load that variable. Then with promises we can do this. Where are you initializing declared userData variable above? initialize function is returning a promise instead of setting data or returning data. We need to take that promise and handle it in such a way that we can fill the variable and proceed our program from there. We are calling resolve method to pass data back to the handler which implements then on the promise. Now let us create a main function where we get the Promise for above function and attach a function callback in the then function. Suppose you want to perform an operation after a promise is fulfilled use another then method to transform the data you obtained from the promise. By chaining then functions on a promise we can pass the data to the next functions. If you are writing logic by initializing data and then using it in multiple functions, above example can help you. The above design is good but not great. We can also queue the asynchronous actions using Promises. Something similar to singleton pattern can be achieved using them. When a value is returned from then, the next then can get the value. We can also return a promise from then so that the next chained then function can use that to build its own logic. The output is the list of details of my Github followers. If you observe above we are returning anotherPromise, but in next then we are using data as normal data. The above code is making two HTTP requests to the Github API but finally receiving the correct data and printing it to the console. We can make a sequence of promises for doing things in a particular order. We can use Promise.all function which takes a list of promises in the given order and returns another promise which we can use a then method to conclude the logic. Let us write a sample program using Promise.all. We are writing it in ES6 style. setTimeout is used to simulate a blocking async operation. We are creating three promises and appending a string to the original variable called message. We should use Promise.all when we don’t care about the order of execution but finally message should be filled with the expected content. results are the result of each promise in the list. That data is passing to printResult function here. The output clearly tells the final message is getting updated properly irrespective of order. Even though this statement is below the Promises, it printed first in the output. Reason is this code will be executed in a non-blocked way. If you are expecting the value to be modified, then implement logic in the then function not outside. Amazon Node SDK is providing the support for promises. They will return you the promise instead of result so you can write your async code on top of their API. If you are looking for advanced usage of Promises, then make sure you go through these wonderful guides below.